Young and old alike came together in the Visitor Center’s atrium to celebrate the 100-year anniversary of Black History Month on Feb. 3. The Multicultural Center, the Student Union & Activities Advisory Board, the Black Student Alliance, and the African Student Union joined forces at the a kick-off event for the rest of the activities planned during February to celebrate black history. The event was primarily a birthday party for Black History Month. Students set out cake, punch, and party hats for attendees to enjoy. Cornel Walton, a peer advocate at the Multicultural Center, gave opening remarks to the crowd about Black History Month and it’s significance. Several posters decorated the center with faces of African-Americans who were prominent in the civil rights movement, including Booker T. Washington, Dr. Martin Luther King Jr. and Rosa Parks. 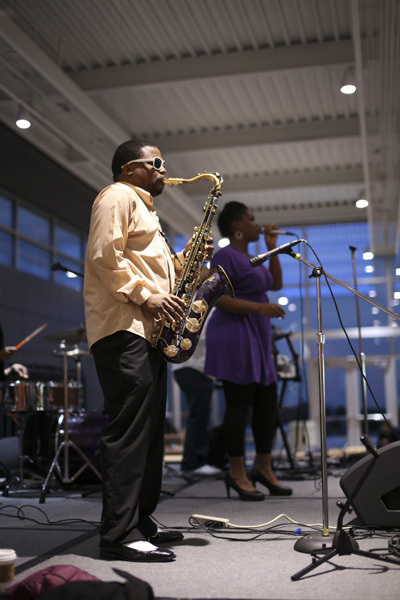 Local band Jason Davis & the Jazz Warriors played music during the event, covering artists from Stevie Wonder to V.I.C. Students formed a dance circle at the first sounds of James Brown’s “Get on Up,” giving their best attempts at Brown’s famous moves. The band musically represented several important genres in African-American music. Attendees were taken back to the 1920s with a rousing rendition of “When the Saints Go Marching In” as Davis and his saxophone led a line of students marching around the visitor center. “I think it’s a really cool celebration of culture, especially of a minority culture that maybe doesn’t get to be expressed as much as it could be on campus,” said psychology sophomore Lavanya Desai. Clyde Fomunung, the vice president of the ASU and a biomedical engineering senior, headed up one of many tables that provided supplies to decorate traditional African masks. “(The African Student Union) thought this would be a good way to show people our culture and allow them to participate,” Fomunung said. Michael Okechukwu, the president of the BSA and a neuroscience and psychology junior, talked to attendees and handed out cards that listed the dates and times of the future events celebrating Black History Month as part of BSA’s initiative to recruit more students. “Even though it’s 28 days, we’re trying to… explain to the people of this generation what African-Americans have gone through throughout the years,” Okechukwu said. The month will end with The Big Dinner, a celebration of African-American heritage with soul food and live performances, at 4:30 p.m. on Feb. 25 in the Galaxy Rooms.